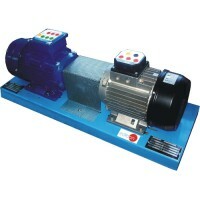 Motor-Generator Group mounted in a painted steel structure. Three phase generator of 24 Vac and 11A currents. 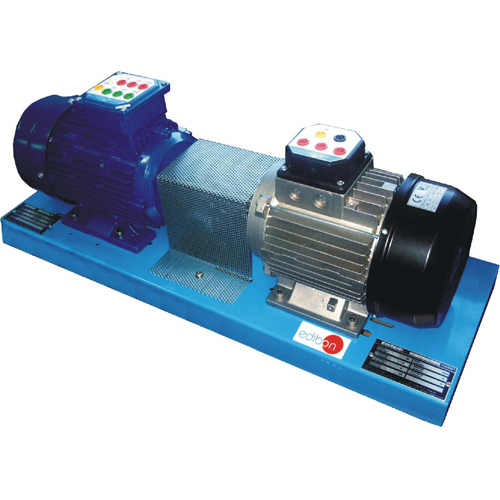 This Motor-Generator Group allows the study of the three phase alternator in both no-load and load regime. Power: 450 W. Speed: 750 r.p.m. Frequency: 50 Hz. V. armature. : 3 x 24 Vac. I. Armature. : 11 A.
Manuals: This unit is supplied with the following manuals: Required Services, Assembly and Installation, Starting-up, Safety, Maintenance & Practices Manuals. Measurements of voltage with no load, measurement of the frequency and measurement of no load losses. Connection to a load. Measurement of the voltage drop with load. Measurement of the power supplied. Behaviour of the alternator with different cos loads.